Right side (passenger side mount). The Foxwing Awning provides the best shade solution for you and your family when you’re out travelling and enjoying the outdoors. Unlike conventional awnings that open straight out giving you just a "square" of shade, the Foxwing's swing out design covers the side and rear of your vehicle providing 270 degrees of shade. Plus, the Foxwing Awning can be set up and packed down in minutes for you to enjoy more of your day. The Foxwing Awning easily attaches to any roof rack cross bar (with the supplied fitting kits). Made from high quality material (rip-stop polycotton canvas) the Foxwing Awning is UV protected, waterproof and mould resistant. 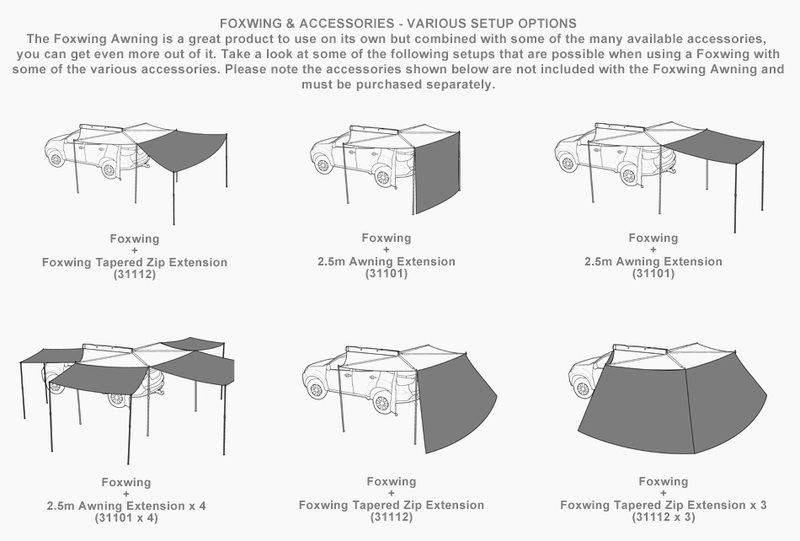 Click the button below to add the Rhino Rack Foxwing 2.5 Awning to your wish list.